There's only one place in the world where you can wander through ancient ruins, staring out at a sparkling Caribbean sea from a coral-crushed, white-sand beach and ponder the possibility of a snorkelling trip. It's Mexico's Yucatan Peninsula. The Yucatan Peninsula has in itself all that Mexico needs to appeal to tourists. An incredible shoreline, crystal clear waters and a forever-growing string of resorts along its Caribbean coast make this stretch of land the perfect place for a beach-infused escape. But away from the coast you'll find a whole heap of history just waiting to be explored. A trip to Mexico's Yucatan peninsula wouldn't be complete without a visit to the islands which lie a short boat ride off the coast. Amongst them, Isla Mujeres has an unrivalled atmosphere for beach-side relaxation, night-time parties and whale shark tours. Much smaller, the island of Holbox is for those who prefer to get an undisturbed night's sleep. On Mayan territory, the archaeological sites justify exploring the Yucatan beyond its paradisical beaches and discovering its extraordinarily abundant heritage. The architecture of these colossal structures, from pyramids and temples, to ball courts, are a dazzling testament to Mayan knowledge of science and maths. 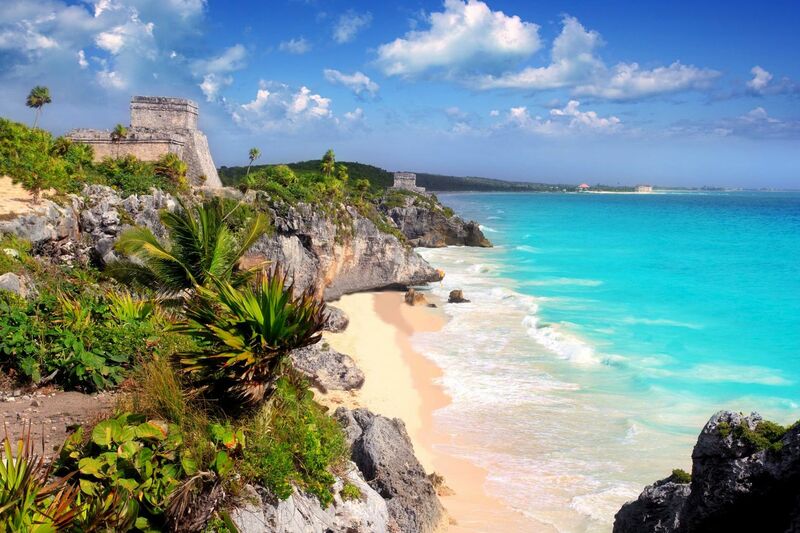 Some, such as Tulum, sit right on the sparkling Caribbean coastline, whilst others nestle further inland, surrounded by ever-encroaching jungle. Away from big tourist centres such as Cancun and Playa del Carmen, the peninsula's colonial cities make for incredible day trips, as well as bases from which to conduct a wider exploration of the entire region. The town of Mérida is far and away the region's cultural centre, with a multitude of museums and old colonial architecture to fascinate you as you wander its central streets. As mentioned above, it also acts as a great base to explore the surrounding countryside with its ruins, waterfalls and reserves. The Yucatan's limestone peninsula is home to one local attraction that you should not miss: the cenotes. These natural gaps in the ground create freshwater sinkholes that can be visited, with diving opportunities at certains sites. Around many of them, you'll find biosphere reserves and national parks which provide a great opportunity to see the peninsula's wildlife and wide-reaching jungles. Though you'll have plenty to keep you busy on dry land, the Yucatan really comes into its own underwater. Diving and snorkelling opportunities along the coast are plentiful, along with regular trips out to swim with whale sharks departing from both the mainland and the peninsula's islands. Not to be missed as either diving or snorkelling visits are the Sian Ka'an National Park and the coral reefs of Cozumel. The best time to visit the Yucatan is between November and the end of May. Between mid-December and the beginning of January, the prices are very high and the hotels are crowded with American clientele on their winter holidays. Winter also provides the best possibilities for scuba diving are better with turquoise seas. In terms of weather, rain and temperatures both increase between June and October. At the end of summer, cyclones can arrive to batter the Mexican coastline which is problematic for those in search of a beach or active holiday. Normally, the Caribbean coast escapes the worst weather but storms are common. November to January provides the best chance of dry weather. For the best beach experience on the peninsula, head out of Cancun to neighbouring Playa del Carmen. Here the vibe is more relaxed and less crowded than the beach-side city that Cancun has become. The focus is less on holiday drinking here, and more on community spirit with a large expat community organising everything from beach festivals to massage services. Though Mexico often gets bad press for its security situation, the Yucatan Peninsula is one of the country's safest areas, due to the high amount of tourists. However, always be on your guard, especially when in big cities and if travelling further outside the Yucatan. The northern region along the border with the USA demands extra vigilance. +The Yucatan boasts the most beautiful beaches in Mexico. +Scuba diving on the southeast coast. +The consistant climate and water temperature. +The great diversity of accommodation. 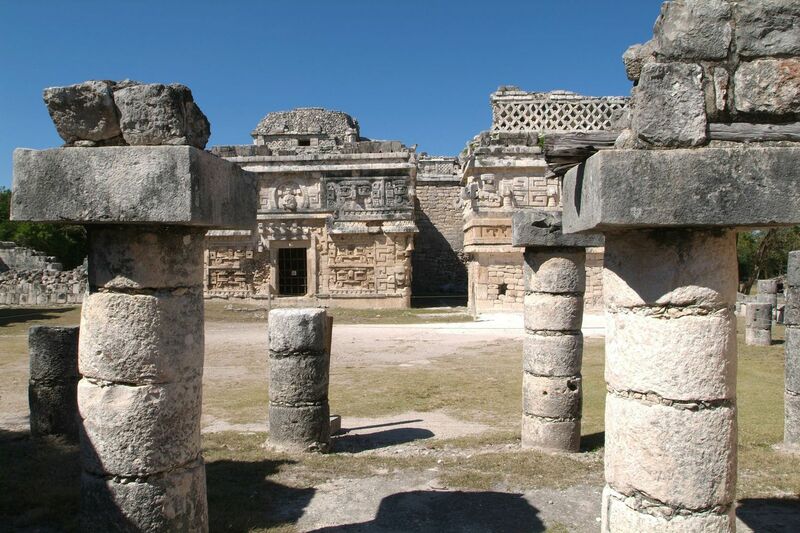 +Three exceptional Mayan sites: Tulum, Uxmal and Chichen Itza. -The americanisation of some resorts, especially Cancun, has led to higher prices. -The proliferation of 'mushroom' resorts such as Cancun and Tulum. -The journeys are often long and monotonous. The Mexicans are very respectful and always polite, so whether you are addressing a waitress, a souvenir shop assistant or a member of the government, being respectful will help your relations with all Mexicans. You will notice that once on friendly terms, affectionate remarks or gestures will become quite frequent, whether it be a tap on the back or a hand shake. If the person you are due to meet is late, do not take offence, it is a case of the 'Mexican quarter of an hour'. Tortillas (corn flour pancakes) are the basis of the food in Mexico. They are prepared to your taste with meats, vegetables, cheese, mild and hot sauces, and they take on different names depending on their presentation and the way that they are cooked: burritos are fresh tortillas, flat on the plate with garnish on top; tacos are rolled with their stuffing and some chips; quesadillas are folded in two, with ham and melted cheese; gorditas are doubled and enchiladas are dipped in sauce, baked or fried and then covered in sauce and fresh cream before being served. There are also chilaquiles, tlacoyos, tostadas or flautas. Each region has its own gastronomy where mild flavours are often peppered with spicy notes. In terms of fish and seafood, the Pacific Ocean is generous and you will find a lot of Cevice fish here (white fish marinated in lime) which is prepared differently on the Caribbean and Pacific coasts. As for chicken, it is eaten everywhere, but becomes a delicacy when served with mole poblano (sauce made with cocoa and many spices). If you are thirsty, beer is the most popular drink and more than a dozen different brands are available, from lagers to brown and amber ales, which always have a light taste. Tequila, the national alcoholic drink, is drank neat or as a 'marguarita' with lemon and crushed ice, but if you don't drink alcohol, there are always the exotic fruit juices. Find weekly weather forecasts for Yucatan . Different criteria make it possible to predict with precision the best time of year to go to Yucatan . A comprehensive weather score, made up of temperature indicators, bad weather predictions, sunshine levels and wind speeds, will allow you to choose the activities best suited to the weather conditions and therefore make the most of your holiday in Yucatan . If you like jewellery, you need to know that Mexican silver is of excellent value and that local silversmiths are very good. Make sure though, that there are three hallmarks: the one of the workshop, the one of the country (a Mexican eagle) and a number corresponding to the alloy (925 = 92.5% pure). Mexico is paradise for handicraft: pottery, glassware, wickerwork, hammocks, (ask for a 'matrimonial' hamock for more comfort), leatherware, wooden toys and masks, colonial style ornaments and Indian cloths. Shops are open every day from 9:00 am (10:00 am for some) to 8:00 pm, with a break from 1:00 pm to 4:00 pm. Handicraft and souvenir markets are open all day from 10:00 am to 8:00 pm. Our journalists' reviews for you 83 hotels Mexico . Take a look at our hotels, their facilities or their value-for-money score according to your departure dates so that we can find the best offer to suit you Mexico . Book a hotel Mexico it's never been so simple ! What is the best time of year to visit Riviera Maya?